To start creating a Hazard, click on Add New. To perform a SIL Determination, SIL Verification, SRS or Cost Benefit Analysis you’ll need to define a Hazard. SIL Comp® allows you to record all vital information that is required and facilitates full traceability from the Drawing Numbers and Node being analysed. Load Hazard – Conduct the SIL Determination, SIL Verification, Safety Requirement Specification and access the Notes and Recommendations. 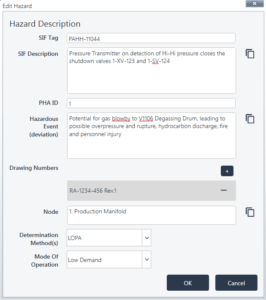 Duplicate Hazard – This will duplicate the Hazard with a new ID, keeping all the information in the SIL Determination, SIL Verification, Safety Requirement Specification and Notes sections. Note: The SIF Tag will not be copied, as this is a unique field. A default will be used until the new SIF Tag is added. Delete Hazard – Delete the Hazard and all of its contents. The module allows differentiation between ‘Low Demand’ Mode of Operation and ‘Continuous’ Mode of Operation. Low Demand Mode – Where the safety function is only performed on demand, in order to transfer the Equipment Under Control (EUC) into a specified safe state, and where the frequency of demands is no greater than one per year. Continuous Mode – Where the safety function retains the EUC in a safe state as part of normal operation. 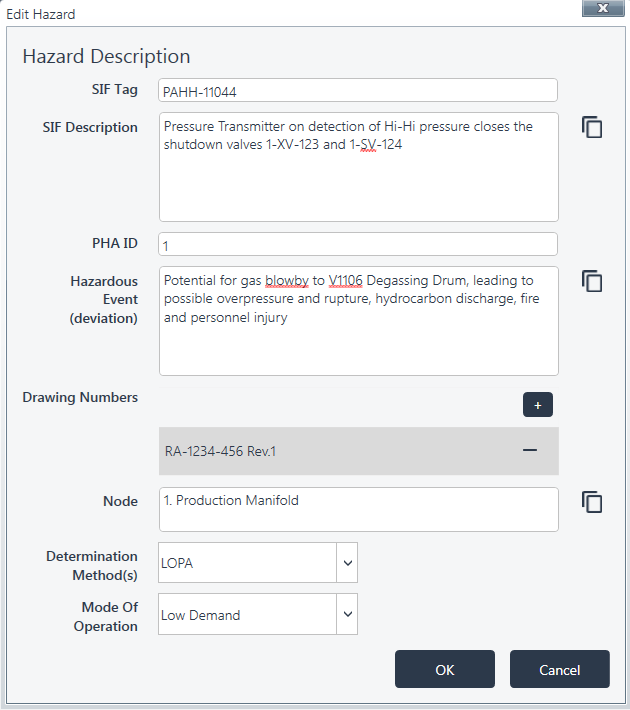 Layers Of Protection Analysis (LOPA) – A semi-quantitative method for assigning Safety Integrity Level (SIL) targets to Safety Instrumented Functions (SIFs). You can list the relevant Drawing Numbers that are included in the Node. You can enter multiple drawings by clicking on the ‘+’ button and remove any incorrectly entered drawings by clicking on the ‘-‘ button next to the Drawing Number. The Drawing Number is an “autocomplete” field, as you enter text ProSET® will search for already entered Drawing Numbers. You can select an existing or enter a new Drawing Numbers. Drawing Numbers on the project can be reviewed in the Drawing Numbers Manager.